In 1682, Pennsylvania’s second county, Chester, was formed. In 1684, the Welsh Tract, a 40,000-acre parcel of land, was created by Welsh Quakers and William Penn to be set up as a Welsh-speaking county. However, by the time the boundaries of the tract were agreed upon, the Commonwealth’s first three counties were well-established—Philadelphia, Chester, and Lancaster, and several Townships had already been formed out of Welsh Tract lands. The Welsh Tract included area in what is now Chester, Delaware, and Montgomery Counties; the Welsh influence can still be seen in many place names of the area, including Honey Brook. By 1815, the village of Waynesburg (now Honey Brook Borough) had a tavern (now the Waynesburg Inn), a storehouse (where the BB&T bank now stands), a two-story stone house, and a school house (where the parking lot by the Presbyterian cemetery is today). All were accessible by the heavily-traveled Horseshoe Turnpike, now also known as Route 322. At that time, the schoolmaster, Mr. Stinson, held a lottery for lots along the Turnpike, and the town began to grow. In short order, houses of worship were founded, Honey Brook Methodist Episcopal Church (now Honey Brook United Methodist Church) in 1823 and Honey Brook Presbyterian Church in 1835. By 1884, the railroad from Philadelphia to Downingtown to Lancaster was completed and ran along the south side of Horseshoe Pike. The railroad caused a problem for the village; there was another Waynesburg in western Pennsylvania south of Pittsburgh, causing freight to be routed to the wrong stations. Hence, the name was changed from Waynesburg to Honey Brook. The main drawback to faster growth was access to water. The village is situated on an elevated ridge dividing the headwaters of the East and West Brandywine Creeks, and for the villagers to access water, they had to dig very deep (and expensive) wells. A petition was circulated in 1891 for the town to be incorporated into a Borough. 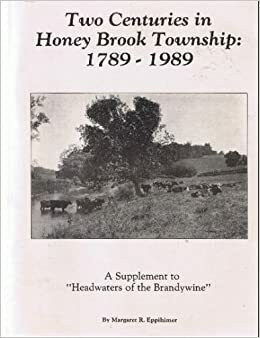 Honey Brook Township is known as “the headwaters of the Brandywine;” no shortage of water there, especially after the 146-acre Struble Lake was constructed in 1950 as a flood impoundment and source of water. The Township’s role as the source of the Brandywine River is important not only for the Honey Brook area but also for our neighbors as far as the Delaware River to the south and east and as far as the Chesapeake Bay to the southwest. The Township’s unique blend of family farms and subdivisions are a reminder of what Chester County as a whole is—beautiful countryside and inviting neighborhoods. Approximately half of the Township’s population is plain sect Amish, as evidenced by horse-drawn buggies frequenting the roads. In 2006, the people of Honey Brook Township voted by referendum their desire to preserve agricultural land, and since that time 0.5% of the Earned Income Tax collected is dedicated to the Land Preservation program. To date, more than 3,900 acres of land has been preserved through easements. Other municipalities and conservation groups recognize Honey Brook Township’s importance and have committed resources towards agricultural easement efforts as well. In 1947, land was acquired for a Township garage. Board of Supervisors meetings were held at either the American Legion or the Honey Brook Fire Company until the Township Building was built in 1972; at the same time a machinery shed was erected. Additions to the Township Building were built in 1977 and 1989, and the Honey Brook Township Police Department shared the Township Building during its existence from 1962-2006. A salt shed was built in 1985 and expanded in 1997. In 2008, an extensive building project expanded the Roads Department facilities to house the trucks and other road equipment under cover, and the Township Administration Office was built across the street. The original, obsolete Township building was taken down. As recently as the 1950s, most of the Township roads were unpaved. Much of the late 1950s and the 1960s were spent paving roads. A Planning Commission was created in 1962, and a Park and Recreation Committee was created in 1979. Land for a Township park was acquired in 1991 and is now home to the Twin Valley Little League, with its three ball fields. The Park was named in memory of one of the Township’s longest serving Board members, James A. Umble. As part of Chester County’s TriCentennial celebration, Honey Brook Township was featured as the Community of the Week. Click here to read the press release issued for the week of May 15-21, 1983. In 2014, Honey Brook Township celebrated the township’s 225th anniversary. Last update: May 31, 2017.